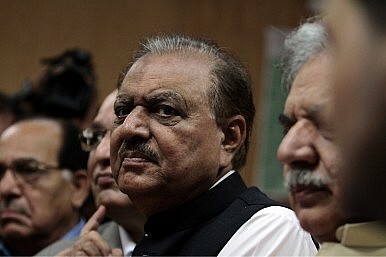 This season of political transition in Pakistan turned another page earlier this week with the election of Mamnoon Hussain as the country’s next president. Hussain’s election follows Pakistan’s historic May 11 polls, which saw Nawaz Sharif’s PML-N party swept into power. The nation’s military chieftain and the influential Supreme Court chief justice will also step down before the end of the year. Hussain is hardly a household name in Pakistan, let alone abroad. Indeed, it is striking how little public information exists about the man who will succeed the controversial Asif Zardari. Though briefly the governor of Sindh, Pakistan’s second largest province, Hussain’s Wikipedia profile was all of seven lines long when he was elected. A textile manufacturer born in what is now India, Hussain is a Mohajir, the Urdu-speaking ethnic group whose forebears migrated from India at the time of the 1947 partition of the subcontinent, and who have dominated the affairs of Karachi for many decades. Sharif and other party leaders no doubt selected Hussain in part because he is from Karachi. The PML-N is primarily Punjab-based, and Hussain’s elevation gives the party some claim to being a national and not simply a regional party. More to the point, Karachi is the financial and economic hub of Pakistan. If the new prime minister is to succeed in righting Pakistan’s rickety economy, there is no better place to begin than Karachi. Stated differently, Sharif will fail unless he can restore political stability, economic vitality, and law and order to Pakistan’s largest city. “I belong to Karachi,” Hussain told a reporter shortly before this week’s vote. “If elected, I’ll try to resolve Sindh’s issues and restore peace in Karachi.” That may prove to be a task beyond his capabilities, but Hussain’s many connections to individuals and political parties who did not back Nawaz Sharif in the May elections could play a more important role than many now anticipate in stabilizing Karachi and the surrounding province of Sindh. Although Hussain has been widely described in recent days as a political lightweight, this is almost certainly an overblown characterization. He has, after all, not simply survived, but flourished, in the bare-knuckles arena that is Pakistani business. He disappeared from the political scene after the 1999 coup that toppled Sharif, but that does not mean he is without experience in deal-making and vote-counting. Under the terms of the 18th amendment to the constitution, adopted in 2010, Hussain will possess only a fraction of the power wielded by some of his predecessors, including Ghulam Ishaq Khan in the 1980s and 1990s, Pervez Musharraf in the 2000s, and Zardari more recently, who even after adoption of the 18th amendment remained Pakistan’s leading political force until the parliamentary triumph of the PML-N in May.